In 1923, the Nation magazine invented a name for a new type of American traveller. This weary or cash-strapped soul, ‘the hitch-hiker’, tried to flag down lifts from passing traffic. They were sometimes known as ‘thumb-pointers’ or ‘thumb-jerkers’, indicating the direction they wished to travel. When the Great Depression arrived, it was almost a civil duty to assist any fist-thrusting folk with baggage. By the time Tom Joad hitched into town in The Grapes Of Wrath and Laurel and Hardy waved an optimistic digit in Way Out West, hitch-hiking had blossomed into a national pursuit and already spread to Europe, the Times noting frequent sightings of ‘the beseeching thumb’. Over here, it took off in the late 1930s. 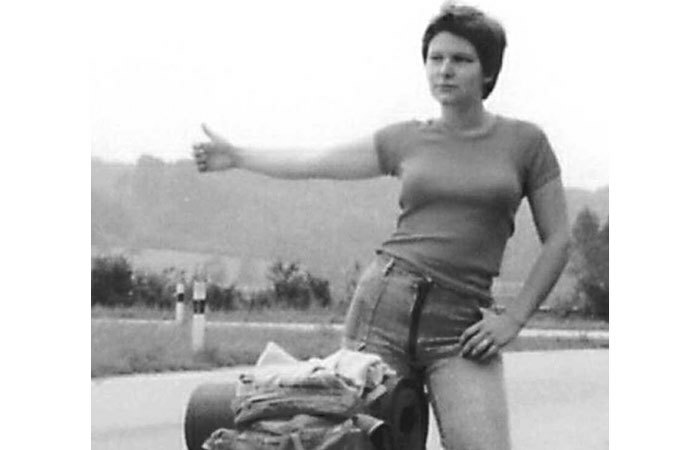 Before then, the hopeful hitcher prevailed upon the generosity or desire for company of any passing motorist. But in the petrol-rationed Britain of 1939, giving lifts was a noble contribution to the war effort. If the hiker was in uniform, it was pretty much compulsory. And you might get to meet some novel, entertaining types with exotic accents from far-off climes such as Pittsburgh or New York City. Trading on this new-found camaraderie, the counter-culture took up the post-war baton inspired by the dusty thumb-fuelled adventures of Jack Kerouac in On The Road, the freewheeling romance of Bob Dylan, and a famous Simon & Garfunkel song in which our hero, his girlfriend, ‘a pack of cigarettes and Mrs Wagner’s pies’, took four days to hitch-hike from Saginaw, Michigan, on their quest ‘to look for America’. But already the wind was changing and people started getting the fear. As news stories and grisly movies made abundantly clear, getting into a total stranger’s car might be a little unwise – Reader’s Digest warned women in 1973 it was ‘like playing Russian roulette’. And giving lifts to total strangers was an equally high-risk manoeuvre. Less crucially, new-fangled motorway travel meant drivers could now be stuck with some crashing bore for eternity and cheap inter-city coaches allowed hitchers to reach their destination without having to sleep in a hedge. I caught the tail end of this glorious vogue and it was unforgettable, thumbing all over Europe in the 1970s, from Athens to Salzburg once in a single ride. My greatest triumph, my epic freeloading swansong, was hitching 9,000 miles round the States in 1977 – though it may have helped that I, too, was with my girlfriend and that brakes were applied a lot faster if she stuck out the thumb and I sat on the rucksacks. There’s precious little to top the sensation of a gleaming 18-wheel Mac Truck pulling up outside Chicago – the scent of warm rubber; chromework glinting in the sun – and some cheery 20-stone bloke in dungarees telling you he’s going all the way to St Louis before filling you to the brim with apple pie at a roadside diner. Nine thousand shiny miles – and all of it for free! Seems unimaginable now. And unnecessary, as these days you can fly to Rome for about £7.50 return including airport tax. Twenty-first-century paranoia has consigned the beseeching thumb to the annals of transport history. The last time I saw a hitch-hiker – years ago – I wondered if he was an armed criminal or a dangerous loon. And he was probably thinking the same about me.